Pretty U.S. actress, Ginnifer Goodwin, looks strangely vintage in this black and white photo, especially with those cute round earrings and an Audrey Hepburnesque short hairstyle. In this short pixie cut she looks young and perky thanks to her pixie styled hair. The deep side-parting allows most of the hair to be combed forwards and to one side, making it look thicker, so this style is particularly good for anyone with fine hair. We like how much emphasis there is on the eyes with this style and the short pointed side-burns and piecey fringe make a great frame for eyes and cheekbones. This is helped by adding round earrings, so the area beneath the fringe and above the earrings is nicely highlighted. 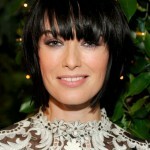 This is a natural look that looks great on dark hair, or you can pep it up with a few highlights. Depending on the colour of your own hair, and its texture, some blonde highlights would thicken the hair-strands and give your more natural volume. A pixie like this, with length on the top, can be varied by adding curls or waves, too! Do you love this pixie cut? If not, you can find more pixie haircuts here or a lot cute bob hairstyles here.